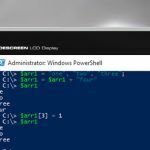 Arrays are used very often when creating PowerShell scripts, so you need to understand how to work with them. In this article we’ll take a look at the basic examples of using arrays in PowerShell. Usually an array is a set of elements arranged one after the other in a certain order. Each element of the array has its own sequence number. To access the desired array element, you need to specify its number (index). $arr1 = $arr1 + "four"
In fact, in this case we did not add elements to the existing array, but created a new one into which the contents of the old array were copied and new elements were added. To delete an array, use the Remove-Item cmdlet (del alias) and remove the array from the virtual disk named variable.